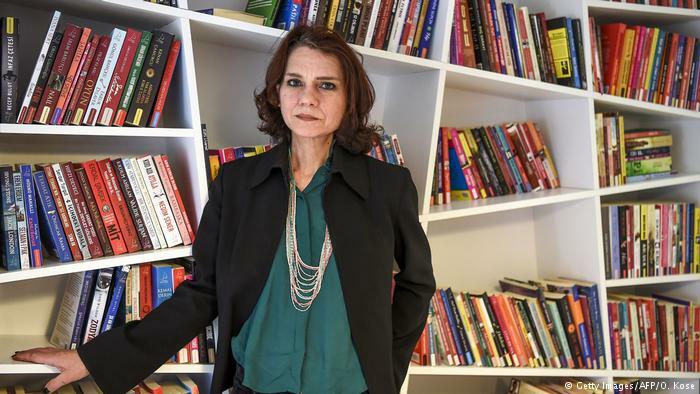 Turkish novelist Aslı Erdoğan, living in exile in Germany as she risks a life sentence on terror charges at home, thinks the writing is on the wall: Her country is sliding into fascism. In President Recep Tayyip Erdoğan — no relation — she sees a man tightening control over everyday Turkish life, emboldened by an outright victory in June elections, sweeping new powers and a crackdown on opponents. “The extent of things in Turkey is like Nazi Germany,” the flame-haired 51-year-old said in Frankfurt, her temporary home as she awaits the outcome of her court case in absentia. “I think it is a fascist regime. It is not yet 1940s Germany, but 1930s,” said Aslı. “A crucial factor is the lack of a judicial system,” she added, describing a country of overcrowded prisons and pro-Erdoğan judges in their twenties rushed in to replace ousted peers. Asli herself was among the more than 70,000 people caught up in a wave of arrests under a state of emergency imposed after a failed 2016 coup against Erdoğan. The detention of the author of such novels as “The City in Crimson Cloak” and “The Stone Building and Other Places,” famed for their unflinching explorations of loss and trauma, drew international condemnation. Turkey’s post-coup purge targeted not just alleged backers of preacher Fethullah Gülen, blamed by Ankara for the attempted putsch, but also opposition media and people accused of ties to Kurdish militants. Turkish authorities reject accusations of wide-scale rights violations after the coup, and the state of emergency was lifted last month, after Erdoğan was re-elected under a new executive-style presidency giving him direct control of ministries and public institutions. “Erdoğan is almost omnipotent,” Aslı said. “It’s an emergency state made permanent,” said Aslı. As for herself, Aslı has given up hope of being acquitted and returning to Turkey anytime soon. “They are not bluffing,” she said she realized after several journalists were sentenced to life terms. She faces charges of spreading “terror propaganda” for her work as a literary advisor to the newspaper Özgür Gündem. The paper itself was shut down, accused by Turkish authorities of being a mouthpiece for the outlawed Kurdistan Workers’ Party (PKK), considered a terror group by Ankara and its Western allies. The next hearings in Aslı’s case are scheduled for October and March. Released from prison in late December 2016, it took Aslı until last September to get her passport back from Turkish authorities.